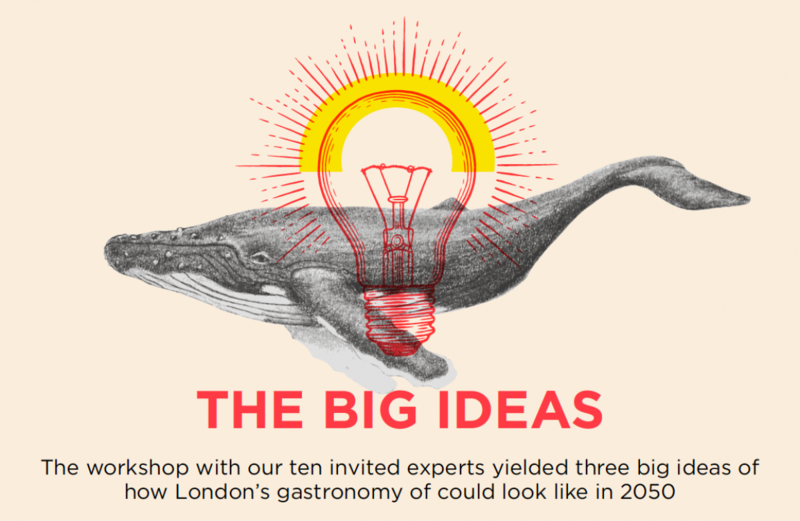 We are setting one challenging question: How do we see the London Food Landscape in 2050? And, can we do something to change it? On April 19th 2018, a panel of 10 Experts from different disciplines will lead the discussion with 70 attendees aiming to share, debate and address in a collaborative way: How can multisensory design create a shift for the future, for 2050? We have 25 spaces to share with the general public, an opportunity not to be missed out. Let's hack the future before it hacks us. FOOD RETAIL How can we empower more sustainable choices in retail spaces? Will still be profitable? FOOD EDUCATION Can we foster the confidence on new ingredients through home cooking? Could this be a tool of social integration? CHEFS ROLE How can the use of multi sensorial elements change the gastronomy of the future? SOURCING & AGRICULTURE AND FOOD WASTE SYSTEMS How can we make diversity and the inclusion of unknown ingredients attractive? Can we make farming and agriculture attractive as profesional choices? PERSONALIZED FOOD EXPERIENCES How can multisensory design create tools to enhance mindful flavour perception? Will this open a path to the creation of personalized diets? We will share the results in our Future Report shared with our Guardians of Good Food network, hopefully enhancing some great projects. Both will be shared through our Future Report for all our network of Guardians of Good Food! Afroditi Krassa is a multi-award-winning interior and branding design firm based in West London. Founded and led by Greek-born, London-based designer and Creative Director Afroditi Krassa, the studio specialises in category-defining hospitality design, and has a critically acclaimed portfolio spanning bars, restaurants, hotels, cinemas and more. Bill Knott started his career as a chef before co-founding the food and drink magazine Eat Soup in 1995. He has since written for a host of magazines and newspapers worldwide, including stints as restaurant critic for the Daily Telegraph, BBC Good Food and BA High Life and – in his present incarnation – The Gannet in the Financial Times. Charlotte completed a degree in Chemistry with Pharmaceutical and Forensic Science and undertook a PhD in Medicinal Chemistry at the University of Bradford. She joined Treatt as a Research and Development Chemist before promotion to Research and Development Manager, gaining vast experience in bench to market product development. The founder and creative force behind Kitchen Theory. Jozef’s years of experience in London’s most highly acclaimed Michelin star restaurants coupled with his passion for gastronomy, art and science led to him establishing Kitchen Theory. Youssef is also the author of Molecular Gastronomy at Home, and is an associate editor at the International Journal of Gastronomy and Food Science. Manager of the Food Industry Programme and Director of the Master (MSc) in Gastronomic Sciences of the Basque Culinary Center, a multidisciplinary programme. He is Editor-in-Chief of International Journal of Gastronomy and Food Science. Part of his scientific knowledge is applied to the design of new dishes in haute cuisine, as well as new products and services development within the food industry. Paul Newnham specialises in generating solutions to complex problems alongside communities around the world. Paul has studied arts and theology; focusing on world religions, history and indigenous studies with a master's degree in international development and experience working with the Australian Army, UN and World Vision. Paul joined the SDG2 advocacy hub incubated in the World Food Programme in 2017 and works with NGOs, agricultural networks, chefs, nutritionists, campaigners, civil society, the private sector and UN agencies to coordinate campaigns and advocacy to achieve Sustainable Development Goals (SDG) 2: end hunger, achieve food security and improved nutrition, and promote sustainable agriculture by 2030. Director of the Institute of Philosophy at the University of London’s School of Advanced Study and the founding director of its Centre for the Study of the Senses, which pioneers collaborative research links between philosophers, psychologists and neuroscientists. Barry works on the multisensory nature of perceptual experience, taste, smell and flavour. Director of Strategic Alliances (Professor of Practice) at Queen’s University Belfast. A senior scientist working at science-policy interface, he has over 30 years’ experience of applied research in the area of food safety and quality. As well as leading numerous national activities, Paul has co-ordinated two of the world’s largest research projects in the area of food authenticity and traceability: the €20M TRACE project (tracing the origin of food) and currently FOODINTEGRITY a €12M EU sponsored research project that aims to address, at a European level, many of the gaps identified during the recent horsemeat incident. He has published over 70 peer reviewed papers on food safety and quality and edited the book “New analytical approaches for verifying the origin of food” (Elsevier). He and has close links with the food industry, UK Public sector, academia and the European Commission. Sarah Appleby is an independent food safety consultant and has recently been involved with developing training courses for environmental health officers working for local authorities and in private industry. Peruvian Chef and restaurateur of Central (Peru) and Lima (London, Dubai), Virgilio chooses to approach the diversity of our ingredients in a manner similar to that used by the peoples of the Andes in pre-Hispanic times: through vertical ecological monitoring. In collaboration with his sister Malena Martinez, Virgilio leads “Mater iniciativa” the biological and cultural research center behind Central Restaurante, where they have come to understand that a plate of food will never be more important than the tradition of a single ingredient. How might we reimagine London’s food system in 2050, specifically designing one that is healthy, sustainable, and delicious? And what actions should we take to make it realized? On April 19th, we sought to address this question by bringing together a diverse set of experts, from various regions and different backgrounds, to use our food systems game to explore possible futures. The use of play allowed for quick collaboration and exploration. Using our own innovative food systems game, our invited experts explored the various interconnections and disruptive events that occur between Social Organizations, Science & Technology, Biophysical, Environment, Policy Making, Market Dynamics. The role of the chef in 2050 goes beyond menus and kitchens; they will be guides and educators for the food system. As AI-driven automation takes over farms and kitchens, the chefs of 2050 London will focus on helping communities shape the food system within the context of the communities’ social values and nutritional needs. Hospitality designer, Afroditi Krassa, sees the chefs of 2050 as working with communities to co-design sustainable farming production and healthy eating habits to educating people about the food system. Juan-Carlos Arboleya, professor and food researcher at the Basque Culinary Center, sees Londoners reframing their food choices as an expression of their social values. This will nudge chefs to an added role in the community: the social activist. Why should we wait? How can we empower chefs today to be educators and co-designers of the food system in their community? How will chefs adjust to their new role beyond the kitchen? What tension and schisms would result? The communal neighborhood kitchen becomes a center of community for Londoners, while their kitchens at home disappear. Just as the family sewing machines gave way to prêt-à-porter clothing, so will the private kitchen give way to accessible, personalized, and on-demand meals. Cooking is transformed into a community event at the neighborhood’s communal kitchen. Perhaps this shouldn’t be too surprising. From the 1980s to 2010s, home cooking has declined by over 50%. By 2050, the convenience of food delivery will replace cooking as the norm. Services like Prep Perfect in the UK and Blue Apron in the US could be precursors to fresh, on-demand, and personalized foods of the future. What can we learn from the communal kitchens of traditional societies that can apply to the future of London? A revolution in personalized health ushers in the reinvention of processed food as nutritious, delicious, and affordable. Health-conscious Londoners will see no contradictions between a macaroni cheese or a fattoush salad for dinner. Advances in nano-cuisine and personalized health will mean that each dish, no matter how it is created, will be customized, personalized for one’s health and flavor preference. In this future, food has literally become medicine, designed with nutrients, ingredients, and cooking techniques that support one’s health goals and nutritional needs. Of course, traditional foods like the Sunday roast or chicken tikka masala can still be had, but if the high taxes doesn’t dissuade you perhaps a warning from your health-monitoring wearable may. If fast-food becomes as healthy as other dining options, how will this change the restaurant landscape? How will the perception of organic foods, often seen as a premium, change in this future?